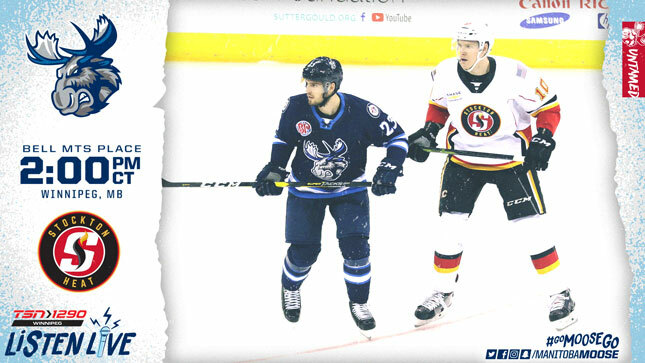 The Manitoba Moose (36-28-5-2) take on the Stockton Heat (29-28-4-2) this afternoon at Bell MTS Place to begin their final home series of the regular season. Puck drop is at 2 p.m. CT with tickets still available at moosehockey.com/tickets. It’s Country Music Day at Bell MTS Place, featuring an in-game concert from recording artists Doc Walker. The first 3,000 fans through the doors will also receive a Sami Niku Bobblehead. The Moose pushed themselves back into fourth place in the Central Division with a two-game sweep of the Bakersfield Condors earlier this week, but dropped to fifth last night as Milwaukee picked up a win over Chicago. With five games remaining for the club, Manitoba’s challenge is to claw back into one of the two available playoff spots with Iowa, Milwaukee, Rockford, and Texas all in the mix. Since Dec. 30, the Moose hold a 25-12-3-2 record for a 0.655 points percentage over 42 games. More recently, the team is 11-3-2-0 in their last 16 appearances a pace they’ll have to maintain for the next week. Defenceman Cameron Schilling looked back to the meeting the club had after the holiday break, saying while it looked unlikely, the team maintained their focus. The biggest part of the team’s resurgence has been their success at home, with just two regulation losses over their last 22 home games (18-2-1-1). Rookie forward Kristian Vesalainen credits the crowd for the club’s dominance in their home rink. In Stockton, the Moose face off with an opponent they haven’t seen since December. The Moose are 1-0-1-0 against the Heat, but have yet to play them in Winnipeg. Manitoba is 5-0-1-0 against the Pacific Division on home ice this season. Seth Griffith and Mason Appleton are coming into today’s action on three-game point streaks with an identical four points each (2G, 2A). On the other bench, Stockton’s Curtis Lazar and Kerby Rychel each scored twice against the Moose in Stockton. Schilling pointed out that while the Moose have a different roster than the last time they played the Heat, Calgary’s AHL affiliate is still a dangerous opponent. 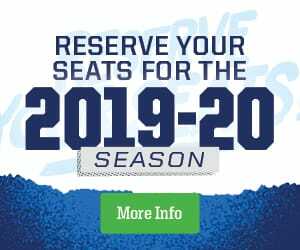 Tonight’s game will be broadcast on TSN 1290, moosehockey.com/listenlive/, the Moose App, and streamed live on AHLTV. Tomorrow’s rematch with the Heat is Fan Appreciation Day in downtown Winnipeg. For tickets, head to moosehockey.com/tickets.